At this facility on 20 December 1951 electricity was first generated from the heat produced by a sustained nuclear reaction providing steam to a turbine generator. This event inaugurated the nuclear power industry in the United States. On 4 June 1953 EBR-I provided the first proof of "breeding" capability, producing one atom of nuclear fuel for each atom burned, and later produced electricity using a plutonium core reactor. The plaque can be viewed at the EBR-I Building, National Historic Landmark, on Highway 20-26, about 60 miles west of Idaho Falls, Idaho, U.S.A. The idea for a breeder reactor (a reactor that could produce more fuel than it uses) first occurred to scientists working on the nation's wartime atomic energy program in the early 1940s. Experimental evidence indicated that the breeding of nuclear fuel was possible in a properly designed reactor, but time and resources were not then available to pursue the idea. After World War II, the newly established Atomic Energy Commission (now the Department of Energy) assigned some of the nation's nuclear skills and resources to developing peaceful uses of the atom. The large bodies of uranium ore found in the 1950s were unknown then, and, since uranium was in very short supply, it was decided that the first power reactor would attempt to prove the theory of fuel breeding. EBR-I construction began in late 1949 at the National Reactor Testing Station in Idaho, now called the Idaho a National Engineering and Environmental Laboratory (INEEL). Early in 1951, a few months before the EBR-I building was completed, nine staff members from the Atomic Energy Commission's Argonne National Laboratory arrived on the scene to install the reactor, which they had designed at their lab near Chicago. The first attempt to operate the new reactor, in May of that year, was not successful. It was determined that there was not enough fuel in the core. Acquiring additional uranium and fabricating slightly larger fuel rods took nearly three months. Then on August 24, Walter Zinn and his Argonne staff brought EBR-I to criticality (a controlled, self- sustaining chain reaction) with a core about the size of a football. Four months of low power operation followed while the operators studied their new creation. On December 20, 1951, the first historic experiment at EBR-I began. The reactor was started up and the power gradually increased over several hours. At 1:50 p.m., the first usable amount of electricity ever generated from nuclear power began flowing from the turbine generator. Four light bulbs glowed brightly to inaugurate the birth of nuclear-generated power. The next day, the experiment was repeated, and sufficient electricity to power the EBR-I building was generated. EBR-I's real mission was not to show that electricity could be generated by a nuclear reactor - scientists already knew that a reactor was a kind of furnace. Splitting atoms inside the core produces heat. Heat can be used to turn water into steam, to drive a turbine and generate electricity, just as a coal- or oil fired electrical plant does. Therefore, EBR-I's chief task was to determine whether scientists' theoretical calculations on fuel breeding would actually be achieved that more nuclear fuel could be created in a reactor than was consumed during the operation. Less that a year after EBR-I generated its first electricity, Argonne scientists calculated that their reactor could indeed breed fuel. Then, early in 1953, a painstaking laboratory analysis showed that EBR-I was creating one new atom of nuclear fuel for each atom it burned. The hoped-for result was a reality. With this kind of encouragement, Argonne scientist began to design cores that would increase the breeding ratio so the reactor could not only sustain its own operation but also produce a little more to fuel other reactors. Three such improved cores were developed over the next ten years. The last of them - called Mark IV - produced 1.27 new atoms of fuel for each atom consumed. EBR-I was used for research purposes until 1964, when the reactor was decommissioned. 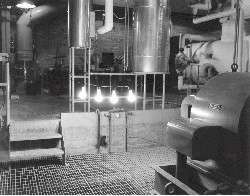 Argonne built a new reactor - EBR-II - at the INEEL and operated it from 1964 to 1994.